Some of the most incredible images are captured at night. Start by photographing the deep blues of "magic hour" and the Portland skyline. Next, shoot the dramatic night lights of Portland's bridges. The Eastbank Esplanade is the perfect location to shoot both. This 2-hour group photo tour is a unique, in-the-field photography learning experience. Groups are kept small for personalized attention. 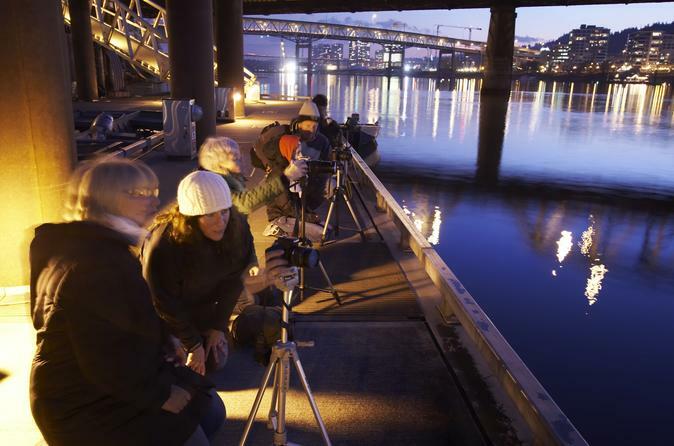 Participants receive hands-on instruction from a photography professional, with the streets and sights of beautiful Portland serving as their classroom. Your guide has been a professional photographer since 2001, capturing 500+ weddings and 200+ portraits, as well as providing instruction to 2000+ photography students. Perfect for beginner to advanced hobbyists. Take home a postcard quality image of beautiful Portland! Fully charged battery and a backup, enough for 2 hours of shooting. Any lenses or lens hoods you may have - wide, standard, or telephoto. Bring a lens cloth if you have it. Good walking shoes and proper attire for the weather- hooded raincoat, waterproof shoes, windbreaker, etc. Prior to your photo tour and with the aid of your manual, locate the below controls. The photo tour will not cover locating these controls on your camera, but you will be learning how to use them.